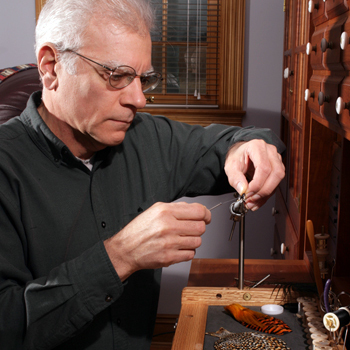 Mike Radencich’s interest in tying Classic salmon flies started when he was about 20 years old. It wasn’t long before he began scouring local fishing tackle shops for fly tying materials and equipment. It was Herter’s Professional Fly Tying & Spinning Tackle Making Manual that first introduced him to classic salmon flies. He didn’t realize it at the time but the “lure” of the salmon fly had planted itself firmly in his psyche, only to emerge quite vigorously some twenty years later. Mike Radencich has been tying the classic salmon fly since 1990. These flies are the most beautiful of all fishing flies. They are truly cativating whether fished on big water or proudly framed and displayed. Listen to Mike share over 20 years's experience in both tying and photographing these exquisite flies. Mike graduated from the University of Kansas William Allen White School of Journalism with a major in photo-journalism and was later accepted and enrolled at the Art Center College of Design in Los Angeles. He subsequently worked as an advertising photographer. Along the way his interest in fly tying still smoldered and, here and there, he picked up a number of fly tying books. Joe Bate’s book The Art of the Atlantic Salmon Fly (Swan Hill Press, 1989) was the book that truly launched his career in tying salmon flies. It wasn’t long before he became frustrated with his efforts simply because he didn’t possess the skills necessary to be successful. There was one tier in Bate’s book that really interested him and that was Ron Alcott who lived in Groton, Connecticut. Mike made contact with Ron and ended up spending a weekend at his house tying and learning. Ron was a great teacher and he revealed to Mike much about tying the classics, most of which he uses to this day. As 1990 progressed he immersed myself ever deeper into the world of salmon fly tying, acquainting himself with many of the best known tiers in the US, purchasing materials, collecting rare 19th century books on the subject. At that time he met Judith Dunham who had just published her seminal work on the salmon fly titled The Atlantic Salmon Fly (Chronicle Books, 1991). It was her book that inspired Mike to consider producing his own book on the salmon fly. During 1991 the book actually began to take shape as he traveled from coast to coast to photograph Wayne Luallen, Bob Veverka and Mark Waslick for chapters on salmon fly tying techniques and then later to visit Darwin Atkin in California for a chapter on matting and framing flies as well as Gene Sunday in Flint, Michigan for a hook making chapter. Tying the Classic Salmon Fly was published in 1997 by Stackpole Books. His second book, Classic Salmon Fly Materials, went to press in 2006 after just a year’s worth of work. Mike’s third book, Twenty Salmon Flies, was published by Stackpole and released in December of 2009. His latest book, Classic Salmon Fly Patterns is still in production and should be released in August of 2012 by Stackpole. To learn more about Mike Radencich, his flies and his books go to: www.RadencichSalmonFlies.com.